John Mac Arthur Beach State Park, referred to by some visitors as a “hidden gem” in North Palm Beach Florida, offers a paradise escape with white sands and beautiful aqua waters. This barrier island is known for its 4,000 square foot Nature Center, William T. Kirby Nature Center, a wonderful educational experience where visitors can learn about the plant and animal life that exists in the park. 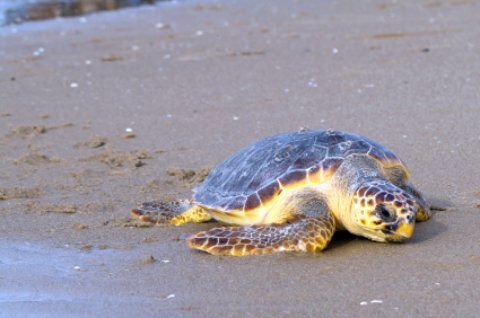 Learn about the rare sea turtles inhabiting the park, such as the endangered loggerhead species or the leatherback turtles, both which are known for nesting here. If you are here in the summer,you may see turtles lumbering back and forth from the sea to their nests where they lay eggs. Note; it is illegal to disturb the turtles or impede their important journeys to and from their nests. The park also offers plentiful flora in its mixture of tropical hammock and mangrove trees as well as many indigenous and now endangered plant species, which provide more beautiful scenery to this serene beach escape. What to Do: The park and beach area offer plenty of activities for a relaxing day with the family, but if you want to explore more, visit Catamaran Mariah of Palm Beach, where you can enjoy a relaxing catamaran tour of North Palm Beach. Where to Eat: Visit the Dockside Sea Grille to enjoy delicious seafood while enjoying an incredible view. If you enjoy Thai food, try Thaicoon Restaurant which offers authentic and delicious Thai cuisine. Where to Stay: Super 8 North Palm Beach hotel offers affordable rates and friendly service.